When brothers grow up together, they usually spend a lot of time playing in the yard or at the playground. Sometimes they pretend they are their favorite college or pro players and dream about one day playing for those teams themselves. For Wally and Henry Ellenson, these dreams came true. 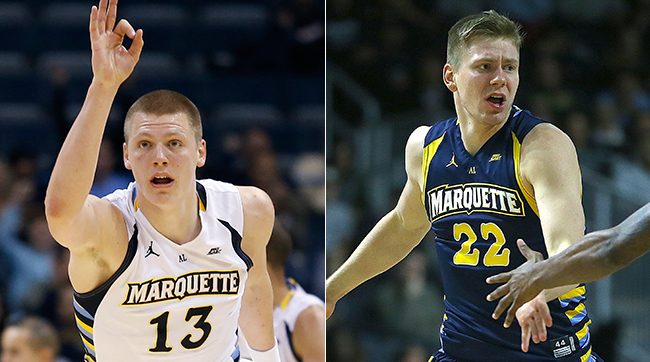 This season, they were teammates on Marquette University men’s basketball squad. Wally is a red-shirt junior. Henry is a freshman. In the Ellenson family, big-league dreams started early. All four kids (including middle brother Ellwood and youngest sister Ella) played every sport they could, from hockey and soccer to baseball and basketball, and even sports they made up in the backyard. One of their favorite family traditions was “Brown Eyes vs Blue Eyes,” when the family played 3-on-3 basketball every Wednesday night. From youth leagues to high school, Wally and Henry played on teams together. 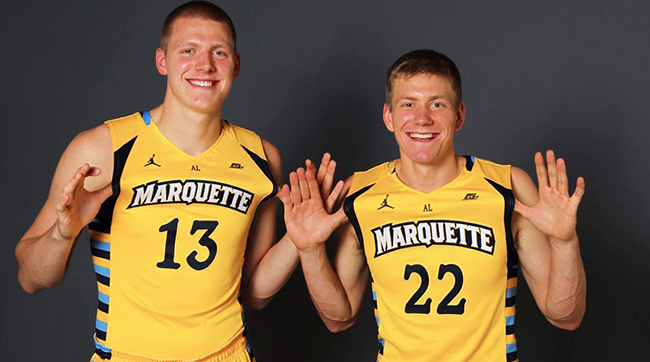 Family was one of the biggest reasons the Ellenson brothers decided to attend Marquette. Attending school together, they help one another balance being both college students and athletes. “The best thing is just being able to see him every day,” Henry says. “Having your brother here — one of your best friends — and enjoying going through the process with him” is great. ​It was also important that the school Wally and Henry attended was close to their own family so the other Ellensons could visit and watch the brothers play. Marquette is about a four-hour drive from their hometown of Rice Lake, Wisconsin. But at Marquette, they found another kind of family: a tight-knit group of guys led by coaches who love the game of basketball. Now that they’re on the same college team, the Ellenson brothers have a lot of other dreams they want to fulfill. Wally is one of the top college high jumpers in the nation. He will compete in the NCAA Outdoor championships in June and could qualify for the US Olympic team. Henry is being considered for the Wayman Tisdale Award as the top freshmen basketball player of the year and will likely be drafted to play in the NBA someday. But wherever their dreams take them, one thing’s for sure: Family will be a part of it all — watching, cheering, supporting each other, and probably playing 3-on-3 on Wednesday nights.